Notes from Pauline Stewart Fox. This gorgeous mare was a delight to show. She earned 35 points in a career cut short by the E.I. Outbreak. 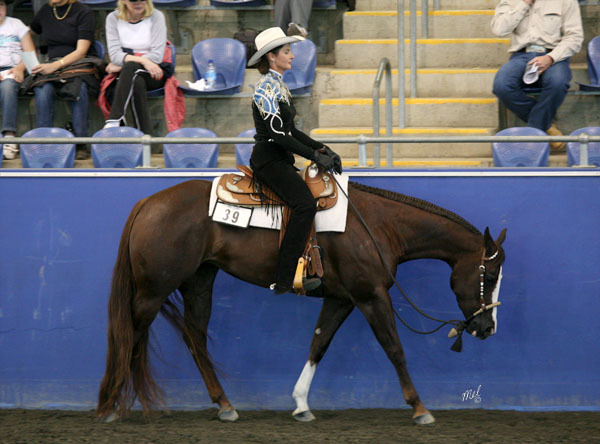 Her few shows included Champion at the 2006 Congress 2yo western pleasure; 5th at the NPHA Celebration 2yo western pleasure futurity. 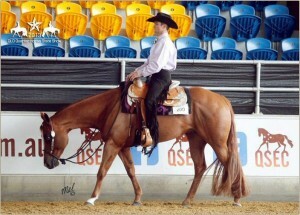 2007- 4th junior western pleasure at the NSW QH state championships and Australian national show. 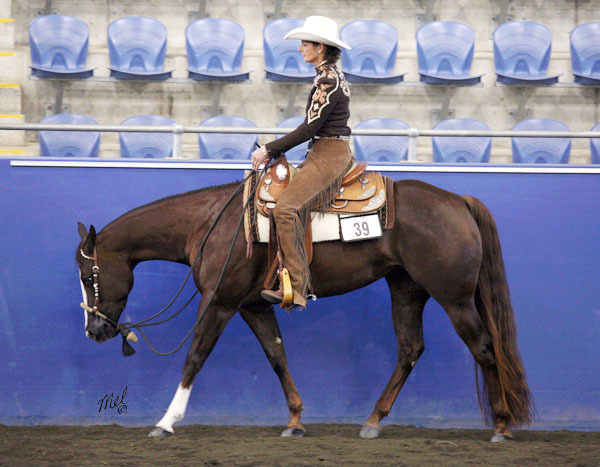 Her dam was a great performer, AQHA national champion 2yo western pleasure and AQHA national Junior horse the following year. Earnt 705 points and is an outstanding brood mare. The maternal grandam is an own daughter of the immortal Gay Bar King. This is the dam of a great line of performers and brood mares. 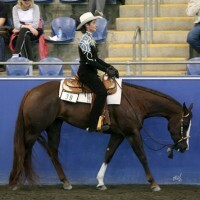 Outstanding performance mare and top brood mare. R.O.M.’s western pleasure; Am WP. 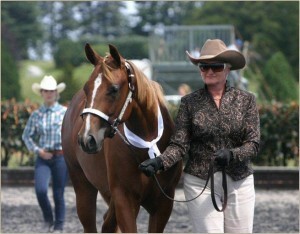 HALTER SHOWCASE 2002 2yo Western pleasure Champion. 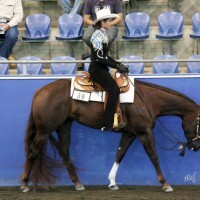 W. Cee Me Shine ; 48.5 all round Points. - leading sire of western pleasure performers for 6 consecutive years. 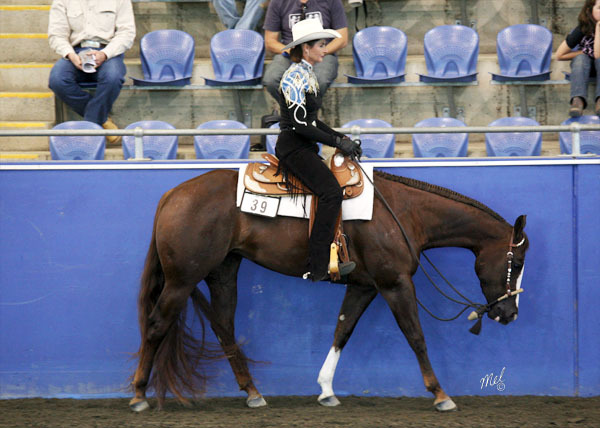 He is the sire of 13 AQHA champions,7 AQHA champion youth performers, 6 AQHA amateur owner champion performers, as well as NPHA champions, NPHA futurity champion and NPHA derby champions, Multiple AQHA National and state Champions. Cee A Barpasser Q-33338 (by Barpasser and out of Cee A Lady Bug), yet another of the great Winderadeen horses, was the first Western Pleasure stallion purchased for Winderadeen. 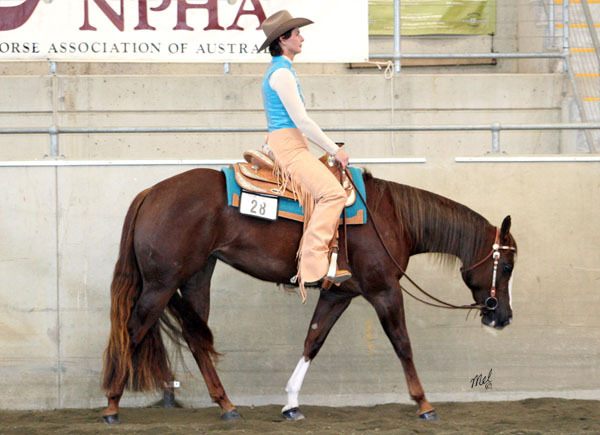 In 2007 he became the first stallion to ever achieve the status of AQHA High Point Leading Sire of Performance Horses in Australia for five consecutive years. 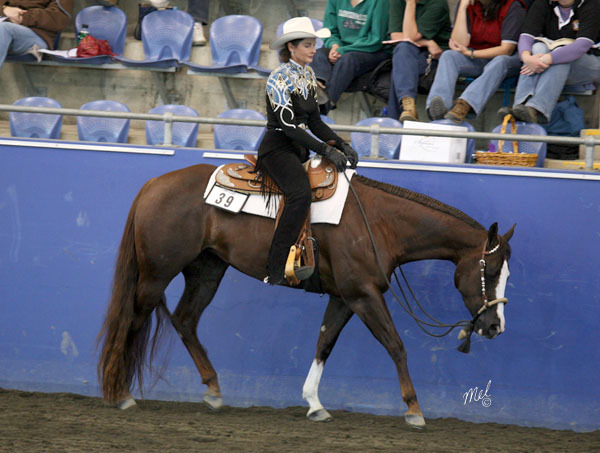 Over the past ten years Cee A Barpasser* produced thirteen AQHA Champions, seven AQHA Champion Youth Horses, six AQHA Amateur Owner Champion Horses, NPHA Futurity and Derby Champions and numerous AQHA National and State Champions and End of Year High Point winners. 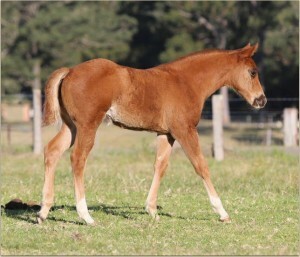 His progeny has dominated at Australia’s major shows in Youth, Amateur and Open classes. Sadly, Cee A Barpasser passed away on 17th September 2007.
by Barpasser from Cee A Lady Bug. 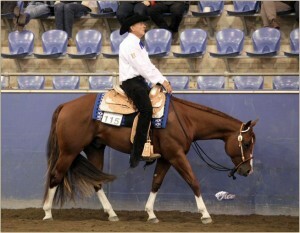 He was the first Western Pleasure stallion purchased for Winderadeen. 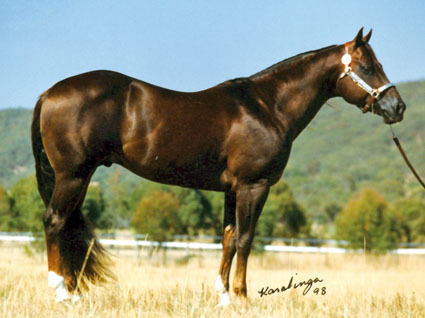 In 2007 he became the first stallion to ever achieve the status of: AQHA High Point Leading Sire of Performance Horses in Australia for five consecutive years! 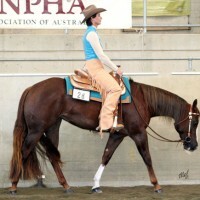 His progeny has dominated at Australia’s major shows in Youth, Amateur and Open classes. Sadly, Cee A Barpasser passed away on 17th September 2007. Congratulations to Dawn Barwick on the purchase of this lovely gelding bought for her grand daughter of 5 years old.He is broken in and being ridden all alone by this little girl. 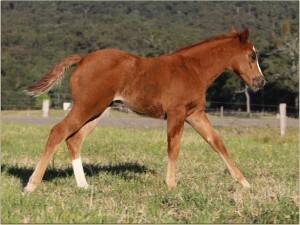 The photo is not an enhancing one but shows how quiet and wonderful the HF Somethin Hot progeny are. 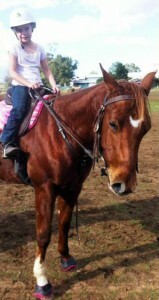 He is being ridden at Pony club and they are having a ball. 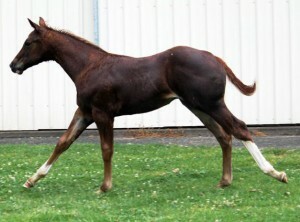 2009 – Chestnut Colt WINDERADEEN HAPPY CHAPPY by HF SOMETHIN HOTOwned by Coronation Park & SOLD to an outstanding home. Thank you Ross and Nette. A big future lies ahead of you all! Congratulations to Winderadeen Happy Chappy and Ross Gould who, two years running have filled the spot of fourth place in the prestigeous NPHA 2 and 3YO WP Futurity event. His proud owners OLIVIA DE SOUSA & ANNETTE SAINSBURY Adore this beautiful stallion and were sure he will produce great babies for them when the time comes. Keep HAPPY Chappy, we look forward to seeing you back to NPHA in 2014.